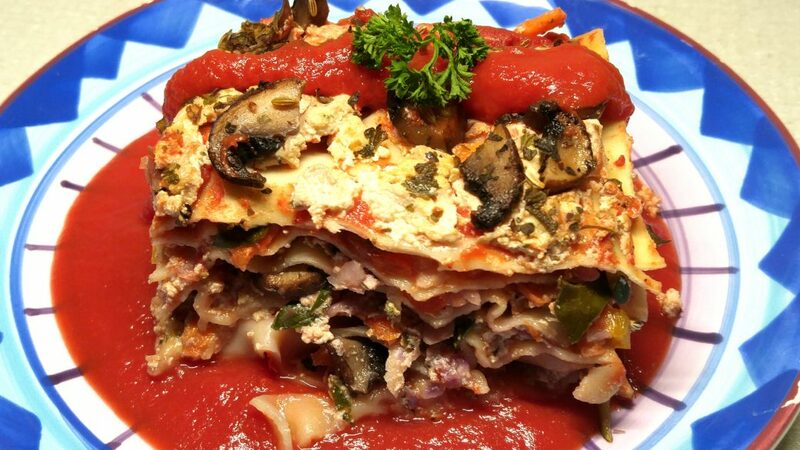 Who says lasagna can’t be healthy? This dish is made from Grated raw (radish, purple cabbage, carrots, zucchini), minced red & yellow peppers, rainbow swiss chard, and sauteed portobello mushrooms. The ricotta was replaced with a blend of tofu, lemon, garlic, and oregano. Tastes exactly like ricotta, both in texture and flavor. Fennel seeds are added to provide a suttle sausage flavor. The veggies in this recipe are just an example. Grating creates a very smooth texture. Use your favorite veggies but try grating them. They cook faster and will still have a slight bite to them. No mushy veggies here. Slice your mushrooms then saute “dry” for about 3 minutes until they reduce in size by half. Mushrooms are sponges. Using oil has no benefit aside from infusing them with unneeded oil. I use a bread pan. Typical size is 8 x 4 x 2 ½ in. In a medium-sized bowl combine the cooked mushrooms with all your veggies, spices and set aside. While your mushrooms are cooking, now is a good time to prepare your tofu ricotta. Combine all the ingredients in a bowl and mash with a fork. You can optionally put them in a food processor but I find that it’s not needed. Blend and set aside. It will taste like the real deal. In this photo, I used whole grain quick lasagna pasta. This can be replaced with thinly sliced layers of zucchini and/or eggplant. 1. On the bottom of your pan coat with tomato sauce. 2. Place your lasagna pasta or thinly sliced zucchini or eggplant to cover the bottom. 3. Cover with 3 Tbsp of your tofu ricotta. 4. Add a layer of raw veggies + mushrooms. 5. For each new layer add tomato sauce and repeat the steps. The top layer will be tomato sauce and the last of the ricotta. I like to reserve a few Tbsp of mushrooms to add on top. Cover and bake for 50 minutes if using pasta or 60 minutes if using raw thin slices of zucchini or eggplant.